Monopati is a company of 168 olive oil producers with 5,200,000 square meters and 93,000 olive trees of the Koroneiki variety growing in semi-mountainous and mountainous olive groves, situated on the sunny slopes surrounded by pine trees, arbutus, lentisk bushes and myrtle bushes in the region of Geraki-Elis in the Peloponnese. Our company was founded in 2013 and is called "Monopati" following the ancient path of history. In ancient Greece, two days before the Olympic Games, there was a tradition of a procession from ancient Elis to ancient Olympia. 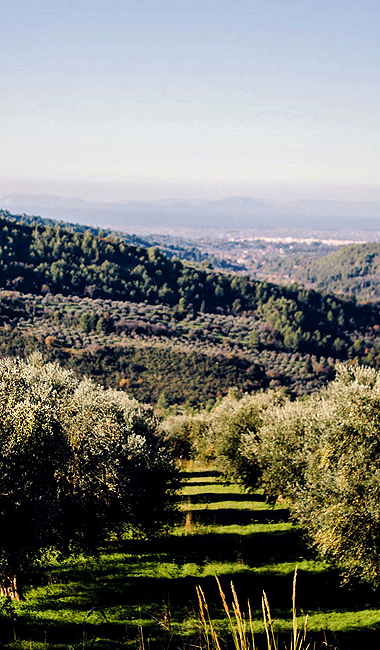 In the middle of the trail toward ancient Olympia where they stayed overnight are the foothills of our olive groves. This trail followed a path measuring 54 kilometres in length where everyone participated: athletes, judges, priests, jurors and all their relatives. So, following our Monopati and with love for olive oil, the land and our history, we developed the olive oil "Monakrivo". This olive oil makes us feel proud since it connects us to our past and to our roots, reaching all the way back to antiquity.